Maintain your EuroStyle Bow Front 80 aquarium in perfect condition with a full range of spares from Aqua One. 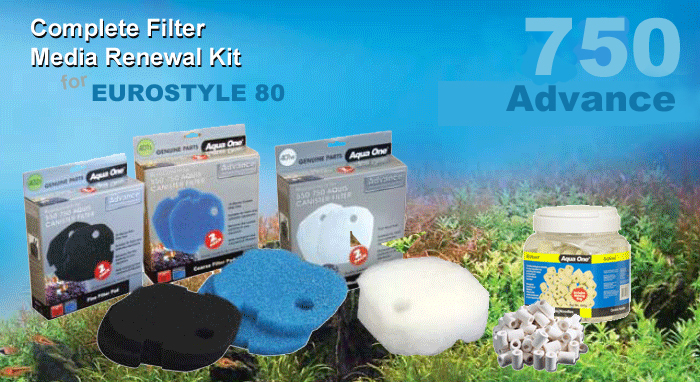 We have all Advance 750 filter media, lighting tubes, heaters, decor and much more... No one cares more about your aquarium than Aqua One and Aquarium Parts. Replacement tap set for the Aquis Advance 550 / 750 filters. Makes filter changes easy again with no leaks and puddles. Replace these Aqua One taps every 12 months to prevent leaks or problems when cleaning the filter. The Aquis Advance 750 Canister Filter is a great replacement for an internal filter on setups of up to 180 litres. It offers far superior filtration with both mechanical and biological elements included and a 3 year warranty. Available in beech, black and oak finishes along with matching cabinets, the EuroStyle Bow Front 80 aquarium brings large screen aquatics to your home or office. Equipped with high output T5 lighting and the award winning Advance 750 Canister Filter, the Bow Front 80 is well equipped to give you endless viewing pleasure. If this isn't your tank or you aren't exactly sure of the items you require please call us. We're dedicated to the success of your aquarium and are fishkeepers ourselves! 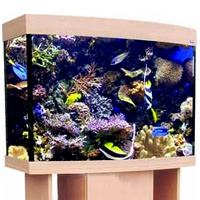 No one cares more about your aquarium than Aqua One and Aquarium Parts. A great improvement on the fluorescent model (which burned-out). Better light, no problems fitting and hopefully a much extended life span. Received the replacement light tube in good condition - sent in a hard cardboard poster tube. Quick delivery less than 48 hours after order. Able to track parcel so knew when it would be arriving via our postman. Would use this company again in future. Received the cartridges in good time and at a good price. It was easy to find the correct cartridges for my tank and I am happy with the service.